IBM® TS3500 Tape Library is designed to provide a highly-scalable, automated tape library for mainframe and open-systems backup and archive that can scale from midsized to large enterprise environments. With features such as persistent worldwide name, multipath architecture, drive and media exception reporting, remote drive and media management, and host-based path failover, the TS3500 continues to lead the industry in tape drive integration. It also includes data encryption capabilities within the drives, helping to avoid the need for host-based data encryption—reducing drain on host performance. Designed to provide a highly-scalable, automated tape library for mainframe and open-systems backup and archive that can scale from midsized to large enterprise environments. Support for tape drive encryption and WORM cartridges enable data security and regulatory compliance. This helps eliminate the need for host-based data encryption, reducing drain on host performance. 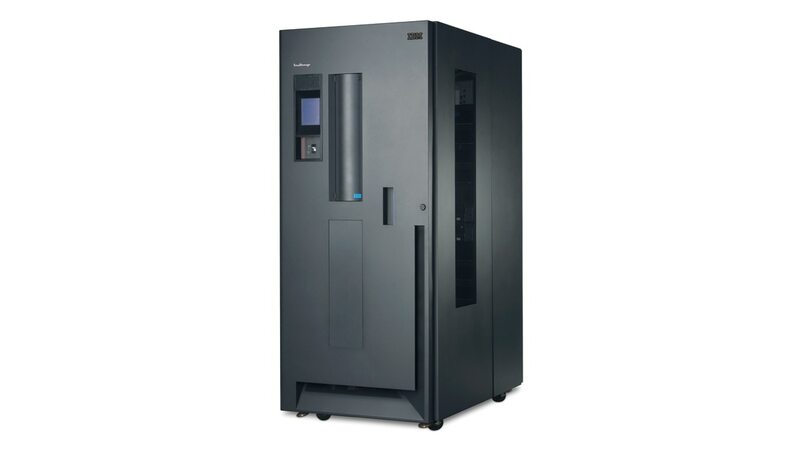 TS3500 supports storage-only library frames with high-density slots that can significantly increase a library’s total capacity yet reduce the physical footprint—reducing overall storage costs.